The National Music Centre president and CEO Andrew Mosker says that while the Studio Bell is in Calgary, it is a Canadian institution. Rising in a neighbourhood called the East Village, the National Music Centre’s Studio Bell is a bold statement. It is a national monument to music built not in Toronto or even Ottawa – but in Calgary. It is a work of impressive architecture in a neighbourhood that could have once, not that long ago, been described as barren. It is multigenre: not a Rock and Roll Hall of Fame or a Country Music Hall of Fame and Museum or a hallowed hall of classical music. 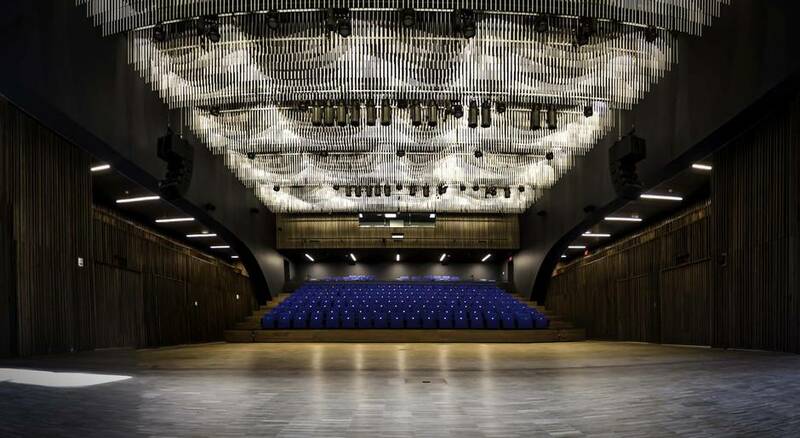 It is not a museum, either, but it has collections and exhibitions; it’s not a school, but there will be educational programs; it’s not a concert hall, but it will host concerts. Mosker put his vision to his board in 2007 and received support to do something “very aspirational, very big.” Construction began in 2013. In addition to the pop-up performances, shows in the auditorium can be heard in the lobby and other areas of the place. So when Mosker walks the few blocks to work watching his vision becoming concrete (well, steel frame clad in more than 200,000 terra cotta tiles), he gets a thrill. So, he reports, do people passing by. What’s inside includes five floors of exhibition space (they call the exhibit areas “stages” rather than “galleries” – the later being too museum-y), interactive displays, recording studios, broadcast facilities and concert venues: a revamped Calgary icon, the King Eddy Hotel, and a 300-seat performance hall. Throughout, spaces have been wired for live music so they can be turned into pop-up concert venues. “We’re not trying to create the encyclopedia of Canadian music; we want to tell stories about music in Canada," says Adam Fox. The fifth floor is the new home to the Canadian Music Hall of Fame, the Canadian Country Music Hall of Fame Collection and the Canadian Songwriters Hall of Fame. You’ll also find the exhibition Icons and Idols. Here, Corey Hart’s sunglasses-at-night Ray-Bans have taken up residence near one of Stompin’ Tom Connors’ wooden stompin’ boards – stomped so many times, it’s almost worn through in parts. Also sharing the space: a Deadmau5 cheese head and Alanis Morisette’s harmonica. Not everything is behind glass. The place is meant to be alive and interactive. You can try out a guitar or drum kit. One floor down, you’ll find musical artifacts including the piano on which Elton John wrote Tiny Dancer and a bunch of other early hits. 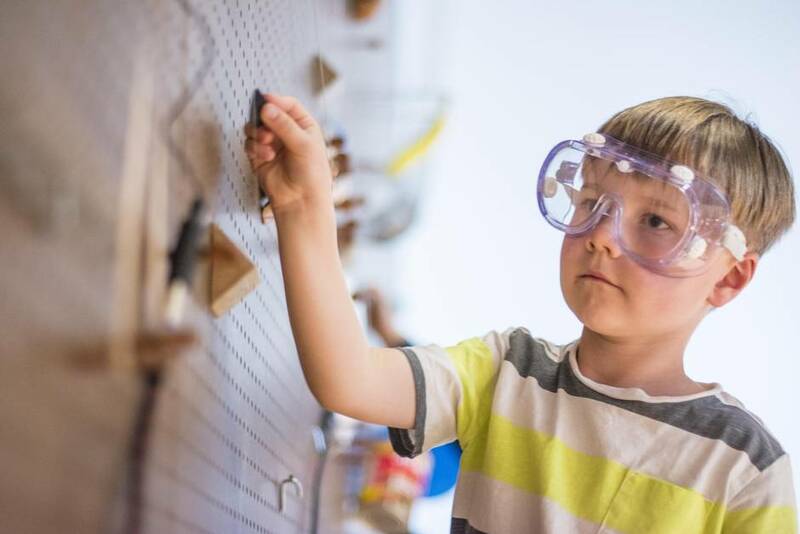 The NMC has more than 2,000 items in its collection; about 20 per cent will be displayed or available for use by artists-in-residence. Previous artists-in-residence include Daniel Lanois, Gotye and Basia Bulat. The oldest item in the collection is a 1560 Italian Virginal. Similar to a harpsichord, it still functions and artists-in-residence can use it. Another highlight is the Rolling Stones Mobile Recording Studio, which was also used by Led Zeppelin and Deep Purple. Jesse Moffatt, director of collections, explains that the last time the Stones were in Calgary, the NMC brought the studio over to their hotel and the band spent about 20 minutes with it, reminiscing. Another highlight is Randy Bachman’s 1959 Gibson Les Paul – on which he wrote and recorded American Woman. 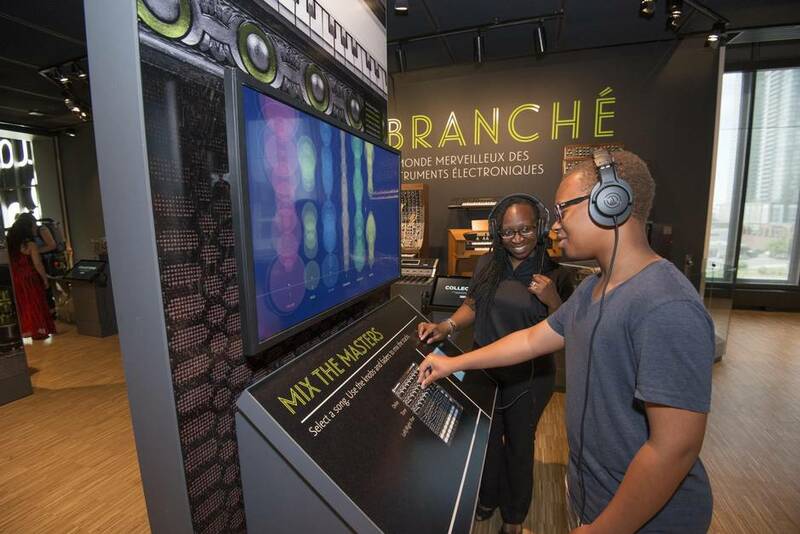 What’s inside includes five floors of exhibition space (they call the exhibit areas “stages” rather than “galleries” – the later being too museum-y), interactive displays, recording studios, broadcast facilities and concert venues. 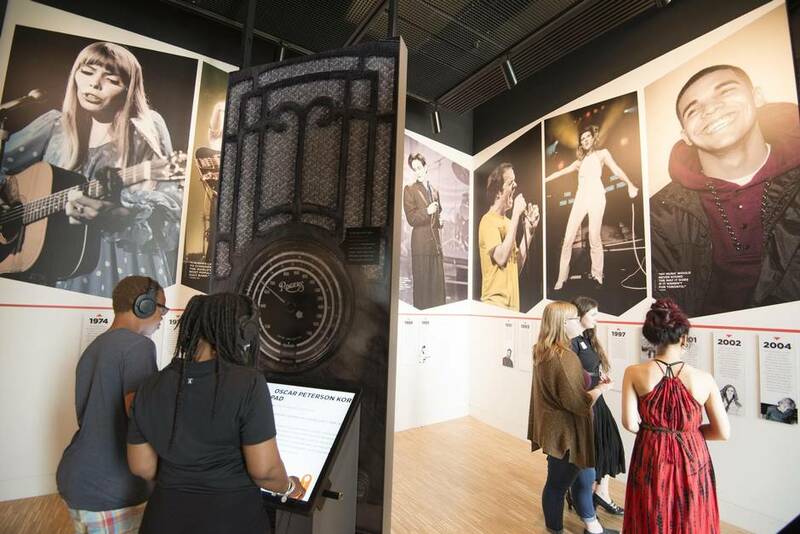 On the second floor, an exhibition explores the history of Canada – a timeline that includes not just Canadian music, but also important musical events that took place in Canada – including John Lennon and Yoko Ono’s Montreal bed-in for peace in 1969. 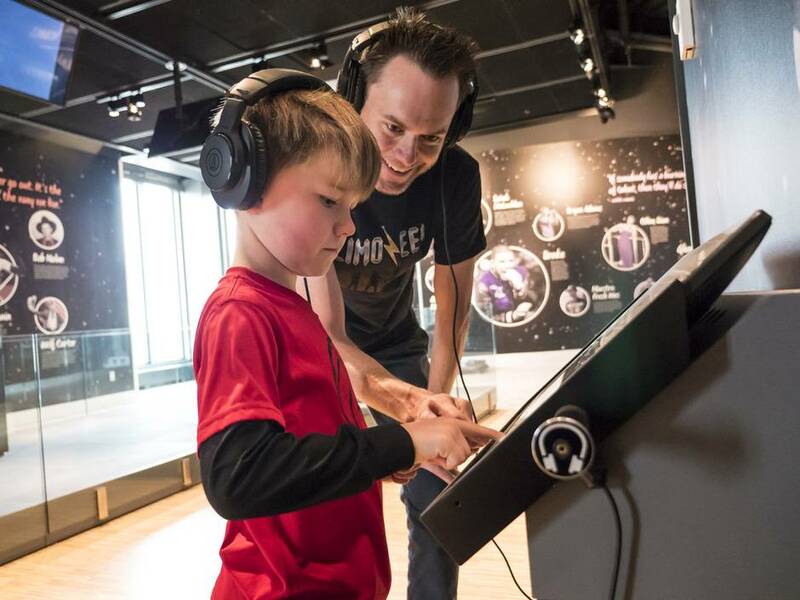 Artifacts on this floor include the Winnipeg-developed Garnet amp and the polyphone – the world’s first analog, voltage- controlled, polyphonic synthesizer, a prototype designed by Canadian physicist and composer Hugh Le Caine. Not everything is behind glass. The place is meant to be alive and interactive. You can try out a guitar or drum kit. You can go into a studio, enter information about your musical abilities and receive a guitar-playing tutorial from a musician. In addition to the pop-up performances, shows in the auditorium can be heard in the lobby and other areas of the place. Behind schedule – it was projected to open this spring – the building is “99 per cent complete,” according to Mosker. 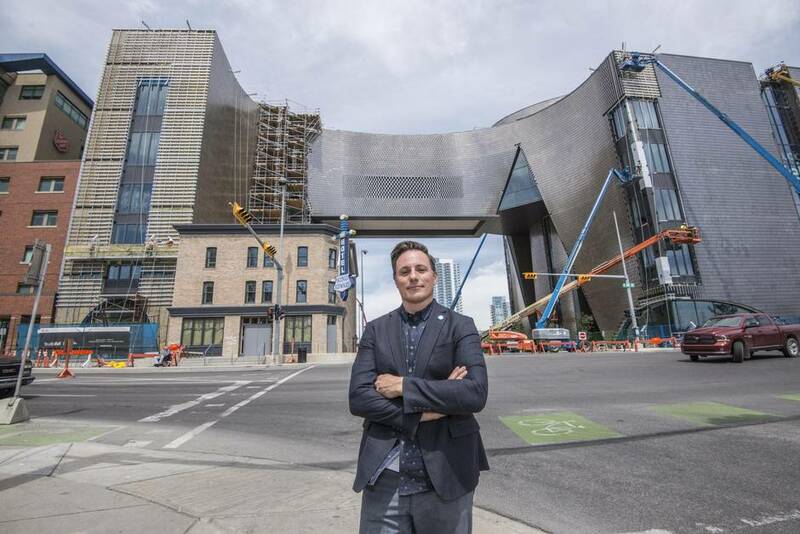 While “architectural completion” is expected in the fall, Studio Bell will open to the public on Canada Day – with free admission on that day (500 guaranteed entries sold out in less than 45 minutes, but they expect thousands more through the doors; admission will normally be $18 for adults). The NMC is not a museum, but it has collections and exhibitions; it’s not a school, but there will be educational programs; it’s not a concert hall, but it will host concerts. The $191-million project is also still about $60-million short of its goal. On that front, Mosker says he’s not worried about the current economic climate in Alberta – stressing again that while Studio Bell is in Calgary, it’s a Canadian institution. “It doesn’t feel necessarily Calgarian; it feels national,” he says. Cloepfil, on his way from Portland, Ore., where he is based, to Calgary for the opening, was effusive about the project. 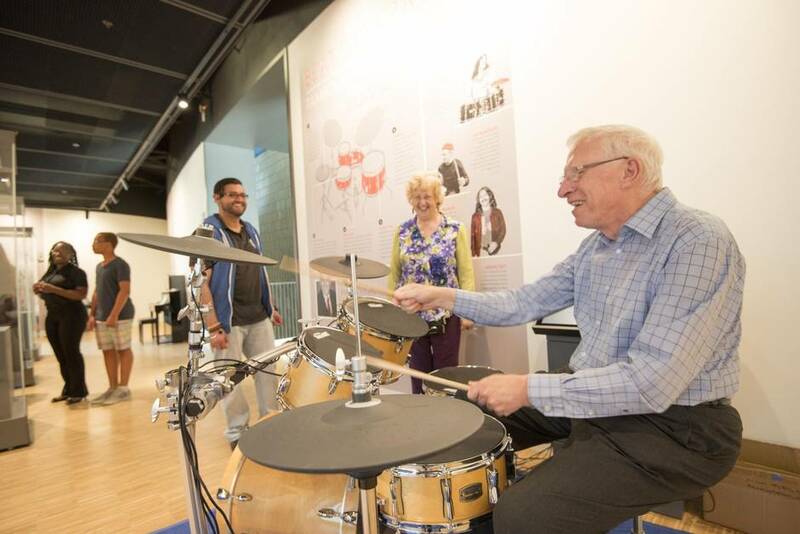 The NMC has more than 2,000 items in its collection; about 20 per cent will be displayed or available for use by artists-in-residence. Cloepfil says the closest model is Cité de la Musique in Paris – although Studio Bell is much bigger and more comprehensive.